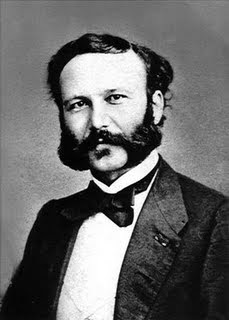 Jean Henri Dunant (1828-1910) was a Swiss citizen, known as the Father of the World Red Cross is a young man who witnessed the terrible war between the French and Italians against the forces of Austria in Solferino, northern Italy on June 24, 1859. was a Swiss businessman and social activist. During a business trip in 1859, he witnessed the Battle of Solferino in Italy. He recorded his memories and experiences in the book "A Memory of Solferino" which inspired the formation of the International Committee of the Red Cross (ICRC) in 1863. Geneva Convention of 1864 which is based on the idea of ​​Dunant; in 1901, he received the first Nobel Peace Prize together with Frédéric Passy. Dunant was born in Geneva, Switzerland as the first son of businessman Jean-Jacques Dunant and Antoinette Dunant-Colladon wife. His family is very sincere Calvinist and had significant influence in Geneva society. His parents are very stressed social values, and his father was also active helping orphans and parolees, while his mother worked with the sick and poor. Dunant grew up during the period of religious awakening known as Réveil, and at the age of eighteen he joined the Society of Geneva to give zakat. In the following year, along with his friends, he founded the so-called "Thursday Association", a loose band of young men who met to study the Bible and help the poor, and he spent a lot of time for people involved in prison and social work visits. On 30 November 1852, he founded the Geneva chapter of the YMCA and three years later he took part in the Paris meeting devoted to the founding organization internasional.Pada in 1849, at age 21, Calvin College Dunant was forced to leave because of poor grades, and she begin an internship at the company's Money Exchange Lullin et Sautter.Setelah successful, he remained as a bank employee. Henri Dunant, circa 1860.Dalam 1853, Dunant visited Algeria, Tunisia, and Sicily, served on a company devoted to the "colonies of Setif" (Compagnie des colonies genevoise de Setif). Despite little experience, he managed to complete the task. Inspired by the trip, he wrote his first book titled An Account of the Regency in Tunis (Notice sur la Régence of Tunisia), which was published in 1858. In 1856, he made the effort to operate overseas colonies, and, after being given land concession by French-occupied Algeria, a corn-growing and trading company called the Financial and Industrial Company of Mons-Djémila Mills (Société Financière et industrielle des Moulins des Mons-Djémila). However, land rights and water are not clearly established, and the colonial authorities was not particularly cooperative. As a result, Dunant decided to appeal directly to French emperor Napoleon III, who with the army in Lombardy at the time. France had fought alongside Piedmont-Sardinia against Austria, which has occupied much of present Italy. Dunant wrote flattering book full of praise for Napoleon III with a view to present to the emperor, and then traveled to Solferino to meet with him personally. Dunant arrived on Solferino on the night of June 24, 1859, the same day a battle between the two sides has been going on dekatnya.Tiga-eight thousand wounded, dying and dead, are still on the battlefield, and it turns out there is little will strive to provide care. Shocked, Dunant himself took the initiative to organize the civilian population, especially women and girls, to provide assistance to the wounded and sick soldiers. They lacked sufficient materials and supplies, and Dunant himself organized the purchase of needed materials and helped set up a temporary hospital. He convinced the population to service cuts regardless of their side in the conflict per the slogan "Tutti fratelli" (All are brothers) coined by a woman near the town of Castiglione delle Stiviere. He also managed to obtain a release of Austrian doctors captured by Perancis.Setelah returned to Geneva in early July, Dunant decided to write a book about her experiences, which he titled Un Souvenir de Solferino (A Memory of Solferino). He has been published in the 1862 edition of 1,600 copies and was printed at Dunant himself biaya.Di in the book, he describes the battle, and cost, and afterwards a mess. He also developed the idea that in the future a neutral organization should exist to provide care to soldiers luka.Dia books distributed to many leading political and military figures in Europe. Dunant also began to travel through Europe to promote ideas nya.Bukunya very positively received, and President of the Geneva Society for Public Welfare, jurist Gustave Moynier, making books and topic suggestions at February 9, 1863 meeting of the organization. They made five of the Committee to seek the possibility of their implementation and made Dunant one of the members. The other is Moynier, the Swiss army general Henri Dufour, and doctors Louis Appia and Theodore Maunoir. Their first meeting on February 17, 1863 is now considered established on the International Committee of the Red Cross. From the beginning, Moynier and Dunant had increasing conflicts and differences of opinion about the individual vision and rencana.Moynier Dunant to consider the idea of ​​establishing neutrality for the protection and maintenance of cellular implausible Dunant advised not to insist on this concept. But Dunant continued to advocate this position trips and conversations with high-ranking political and military figures. This intense personal conflict between Moynier, who took a more pragmatic approach to the project, and Dunant who is an idealistic vision of the five, and led by Moynier to attempt to attack Dunant and bid for the leadership. In October 1863, 14 countries took part in the meeting in Geneva organized by the committee to discuss the improvement of care for wounded soldiers. Dunant himself, however, simply because the protocol Moynier leader of efforts to reduce its role. A year later, a diplomatic conference organized by the Swiss Parliament led to the signing of the first Geneva Convention by 12 countries. Among several other awards in the following years, in 1903 Dunant was awarded an honorary doctorate by the medical faculty of the University of Heidelberg. He lived in a private hospital in Heiden until the end of his death. In the last years of his life, he suffered from depression and paranoia about pursuit by his creditors and Moynier. There are even days when Dunant insisted that the cook in a private hospital first taste of food before he asked to protect against the possibility of poisoning. Although he continues to embrace the Christian faith, at the end of the year he Spurned and attacked Calvinism and organized religion in general. According to the nurse, acting late in life is to send a copy of the book to the Italian queen Müller with a personal dedication. He died on October 30, 1910, outliving his nemesis Moynier by only two months. Although it survived the ICRC on the awarding of the Nobel prize, the two rivals never reached reconciliation. According wishes, he was buried without ceremony in Sihlfeld Cemetery in Zürich.Menurut he will, he donated funds to secure a "free bed" in the Heiden nursing home that will always be available to the poor in the area and deeded money to friends and organizations social in Norway and Switzerland. The rest of the funds to creditors partially relieving his debt; its inability to clear that debt is a huge burden for him until his death. Former private hospital that now houses the Henry Dunant Museum Heiden.